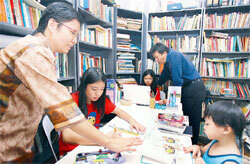 Homeschooling is featured on China Press on 12th May 2008 – perhaps for the first time in a Chinese newspaper. This is a well-written piece, depicting a positive picture of learning from home (and the pictures are well angled too!). Unlike the earlier piece on an English newspaper, this piece was conceptualized and brought to fruition with out bringing on perceived negative notions or getting views from educational experts who are not well informed about home education. It beautifully captures the spirit and joy of homeschooling because the writer, editor and photographer were open minded about it and were not out to prove anything to anybody. For that we congratulate and thank the editorial team who did the story. Thank you for a story well written! We hope more Chinese-speaking families would jump on the bandwagon of homeschooling for a more holistic experience of learning and living!